The bids for upgrading the Murdock Trail actually came in under the estimate, so construction began immediately is finished! 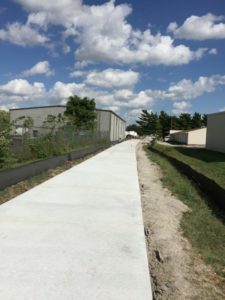 The completed project adds a paved trail while retaining the limestone side path. This is a first for Lincoln. The new concrete trail allows Parks and Recreation to remove snow in the winter, making the Murdock a year-round trail for running. The project is also expected to correct the persistently poor drainage that has plagued this trail since its construction. A community celebration is scheduled for November 18. Find out more here. The goal of the color scheme was to make the trails easier to use for visitors or local runners and bikers in an unfamiliar area. Arrow signs follow the color scheme. If you are running on the Billy Wolff and come across a pedestrian bridge over Antelope Creek and spot a sign with a black arrow, that is your signal to cross the bridge. 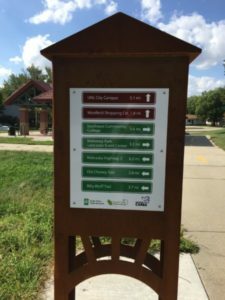 Lincoln is in the process of installing several trail kiosks that will be located at the intersection of major trails and will provide a new level of information. One side will have a citywide trail map with a “you are here” indicator. The other will give mileage to major destinations. The kiosks follow the color scheme. At the MoPac Trailhead at 84th Street, for instance, you can learn that by heading west on the MoPac you can reach the UNL’s city campus in a little over 5 miles, or heading north on the 84th Street Trail, you are 3.2 miles from the Lancaster Event Center. 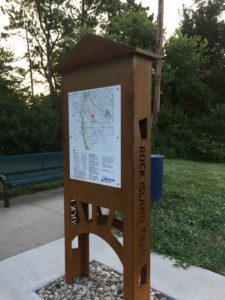 At the Rock Island at Boosalis Trail (near 27th Street and Highway 2 by Arby’s), you’ll discover that running 4.2 miles south on the Rock Island will take you to SouthPointe or running north for 4.3 miles will take you downtown. The kiosks are funded through private donations and will be installed gradually as money comes in. When you are in the middle of a marathon training program, the increasing long runs and even midweek intermediate runs can get really tedious as muscle fatigue sets in. One way to create a diversion is to get your running buddies to explore some new trails. With the kiosks and trail signs, it is easy to plan a run and to find your way in a new area—as long as you know your colors. 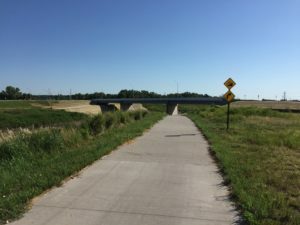 After a long delay, the Salt Creek Levee Trail is open under 10th Street. The installation of the new North 10th Street bridge had temporarily blocked the underpass and seemed to drag on as unfavorable weather lengthened the construction project. But now the barricades are finally down. You can run without a detour from the Haymarket Ball Park northeast to Innovation Campus (the old fairgrounds) and the Devaney Center. Click here to become a member of the Great Plains Trails Network.